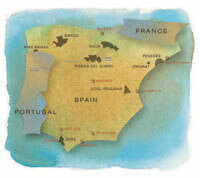 Galicia (for we are here) is known as Green Spain. Rias Baixas translates as low estuaries, a phrase that conjures up visions of the Camden Locks rather than your usual Spanish vistas, and this is indeed what you are likely to encounter in this cooler, wetter DO that touches Portugal and the Atlantic. Desert dust-bowls and bush-vine Garnacha this is not. In fact, the focus here is on white varieties, in particular Albariño, which can knock out some stunningly fresh, tangy, mineral-tinged wines that rival anything from Alsace, Graves - or Marlborough - when done in the right way. The winemaking is the key of course, and here, what John Radford calls 'fingertip light' winemaking - hands-off viniculture, stainless steel tanks, minimal winery intervention - allows the grape to show its true colours.